There are two monthly gamedays, mostly boardgaming but not exclusively, happening in Wisconsin the third weekend of each month. 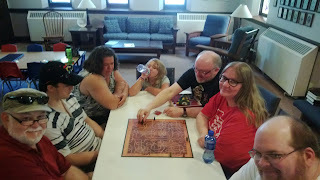 On Saturday, at the Plymouth UCC in Burlington, WI, Steve Sullivan and Kiflie Scott co-host gaming from 11 am through 5 pm (and later if things are still going!). There is no charge for the Burlington gameday. 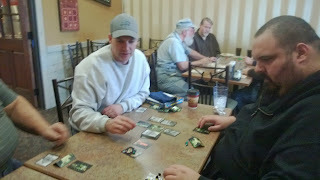 On Sunday, Wayne "Von Deekin" Targo, President of the South Lakes Area Gamers (S.L.A.G. ), organizes A Gathering of Gamers at the Pizza Ranch in Elkhorn, WI. This gameday requires a buffet charge plus the cost of an extra soda, but the food and beverages are available all day for attendees.